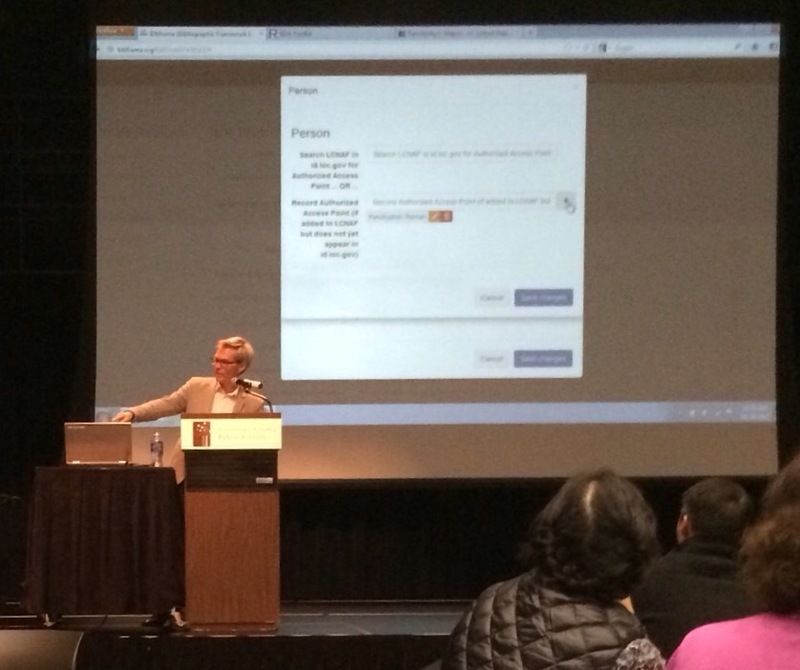 The third Ohio Institutional Repository (IR) Day on Friday, October 23, 2015, focused on open access topics and was a great finish to Open Access Week. The morning began with introductions around the room, with many new attendees, some of who are starting to set up IRs. It is always interesting to hear about concerns and questions from people beginning IRs. While some of it is technical, gaining support and driving use are crucial to success as well. For the keynote, Dave Stout (Bepress) announced the new Ohio Research Commons, a free resource that complies all Ohio Bepress IRs into a single resource for searching. In addition to statewide collections, there are also legal resources, open educational resources (OER), and many other topics that Bepress is creating. The lightening round presentations covered an array of open access topics, from advice from those just beginning to integrating an IR into other systems on campus. Alan Boyd (Oberlin College) began the round with his talk about Oberlin’s open access policy and how they were able to put it into place. Along with his advice, he acknowledged that every campus has a different culture which should factor into how schools wanting to discuss or set up such a policy must take into account. Anne Davies, Michelle Early, and Alison Morgan (Xavier University) spoke about adding syllabi to their IR. While this might sound straight forward, they faced challenges with making them open access since it isn’t a true publication of the professors and many were cautious with having it freely available when they worked to make their courses unique. As a compromise, the syllabi are limited to campus access or by request for non-campus users. Eric Johnson (Miami University) presented on their Scholar’s Portal, which serves as a bibliography page for their campus. Since the capabilities stretch beyond their IR, it took additional software and programming skills to set it up. Unveiled the week before, they are now promoting it and even have short how-to videos that explain how to create and populate a profile. Amy Koshoffer (University of Cincinnati) discussed self-submission of researcher data into their IR. While convenient for those running the IR, they found that there needs to be education around how to submit so that their faculty enter their work with the most benefit to themselves, with complete description to help others find and use their work. Also, UC created short videos of their faculty proponents to promote the library’s preservation services with Scholars@UC. Cindy Kristof (Kent State University) gave an overview of open access, the different types of OA and copyright. She even detailed specifics of copyright law and was a great review for those already familiar in addition to being a helpful introduction for those new to it. The day wrapped up with birds of a feathers conversations, which are always interesting discussions. The six topics as focused on particular OA access aspects, from creating a campus policy to how public domain factors relates to OA. Slides for all presentations are available in the WSU IR. Even though USETDA is a short conference of only three days, it has been one of these most jam-packed (in a good way) that I have attended. Many of the sessions are practical while even the more theoretical sessions had takeaways that could be put to use right away. It is clear that there are many commonalities in dealing with ETDs even though every institution’s program is at different stage. Concern about supplemental files, creative ETDs that are more than just text, embargoes, preservation, and accessibility are all universal topics. To finish out the conference today, there were two final all-morning workshops offered. Nick Krabbenhoeft (Educopia Institute) held a workshop on the Lifecycle Management of ETDs (Abstract, PDF). He walked through the Lifecycle document that covers the entire process starting with setting up an ETD program through preservation and assessment, and provided additional insights. We also had several discussions of our different experiences with ETDs locally. The last portion of the workshop covered curation tools and brief demonstrations of a couple of them, including Hiberlink and PREMIS Event Service. While I couldn’t make it to everything, I kept hearing about great sessions that others attended and thankfully all of the materials are shared on the conference proceedings page, which is where all of the abstract and PDFs links in my USETDA blog posts are from. 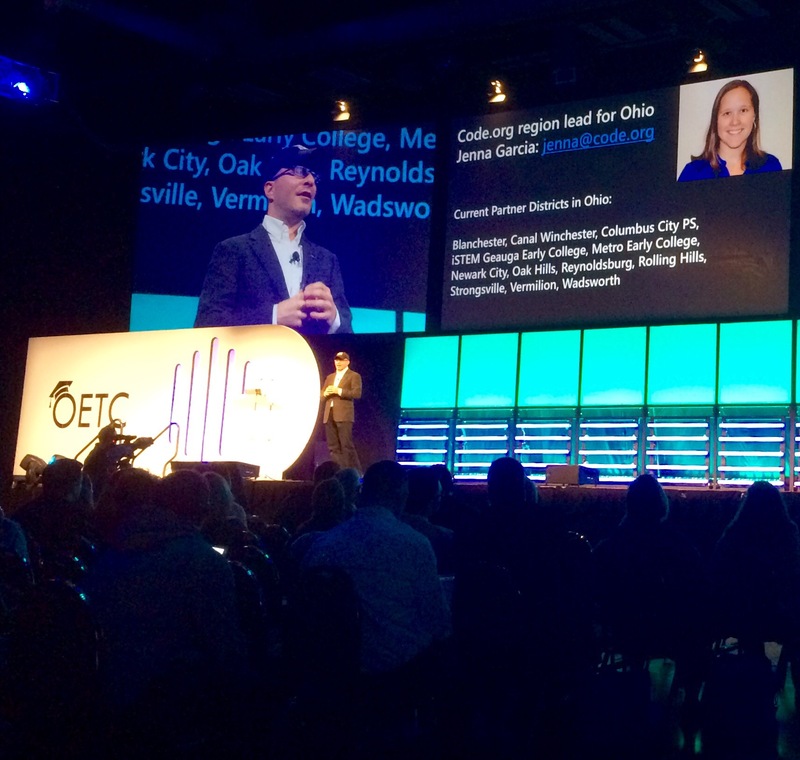 I enjoyed my first USETDA conference and look forward to helping host it next year in Columbus, OH. Hope to see you there! 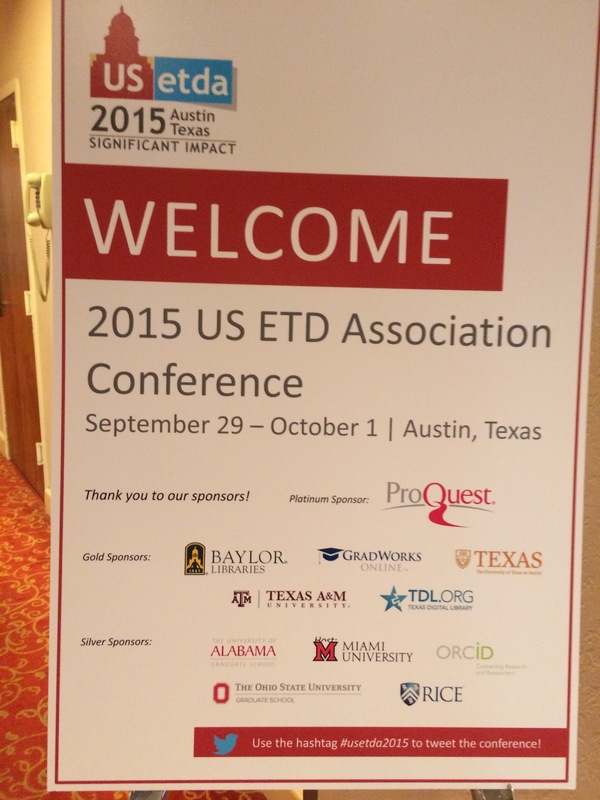 The second day of the USETDA conference was just as busy as the first, with many great sessions once again. The morning began with a keynote from Lorraine Haricombe (UT Libraries) titled On Life Support or Leading: Academic libraries in a new paradigm (Abstract, PDF). She spoke about libraries needing to step up as leaders in the changing needs of our users to fill more niche roles that are possible such as being a contributor or partner in faculty and student research and data management throughout their process. She also called for more action for open access initiatives, beyond just ETDs. Although many presentations looked good, I attended Nick Krabbenhoeft’s (Educopia Institute) about the current ETDplus project, When Students Want to Submit More than a PDF (Abstract, PDF) which focuses on the supplemental files that accompany many ETD submissions. Their expected deliverables include curation software, guidance briefs for different stakeholders (students, staff, etc. ), and a training workshop. There will be open review and comment phases next summer/fall so I am looking forward to seeing what ETDplus will offer. This is certainly a topic that needs to be addressed. Next, Todd Bruns (Eastern Illinois) presented Getting Better All the Time: Using Continuous Improvement to Drive Thesis Enhancements (Abstract, PDF). Once the ETDs were into their IR, they wanted to make the records better and did several projects to do both minor and major improvements. The continuous improvement model ensured that their projects were planned, documented, then reviewed after completion to help manage and assess their efforts overall. The PDF slides have more details about what and how their improved their ETDs and metadata displayed in the IR for anyone who interested in learning more, including representing physical specimens and samples in the IR and ETD records. For the evening, conference attendees chose one of several restaurants for the dine-arounds to explore Austin’s great local food scene. I ended up at Bangers Sausage House and had a great time getting to know other attendees and enjoyed an antelope and venison sausage. 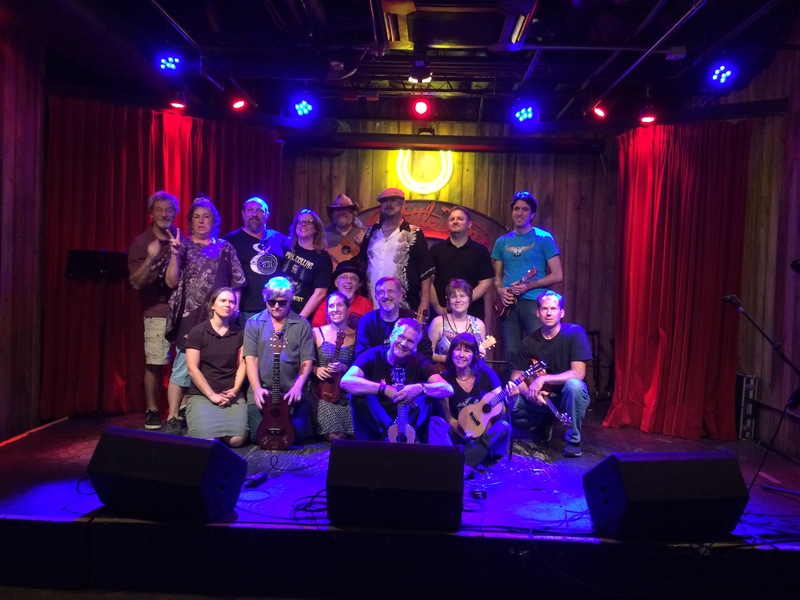 Then, since it is Austin, my husband Steve and I went to an open mic night, in particular a ukulele open mic and he even got to preform (back row far right). Who knew there was an Austin Ukulele Association? We had an awesome time at the Rattle Inn and everyone was so supportive and heartily cheered on all of the performers. What a fun time!